Moufida Boumerdas, La fabrication des villes nouvelles en Algérie entre configuration spatial et pratiques sociales: cas de la ville nouvelle de Massinissa, PhD in Geomatics, in co-direction with Prof. Said Mazouz, University Oum El Bouaghi, Algeria, submission planned in 2021. Amin Hammami, A psycho-acoustic and geomatics approach for the representation of urban soundscapes, PhD in Geomatics, University de Bretagne Occidentale, submission planned in 2021. 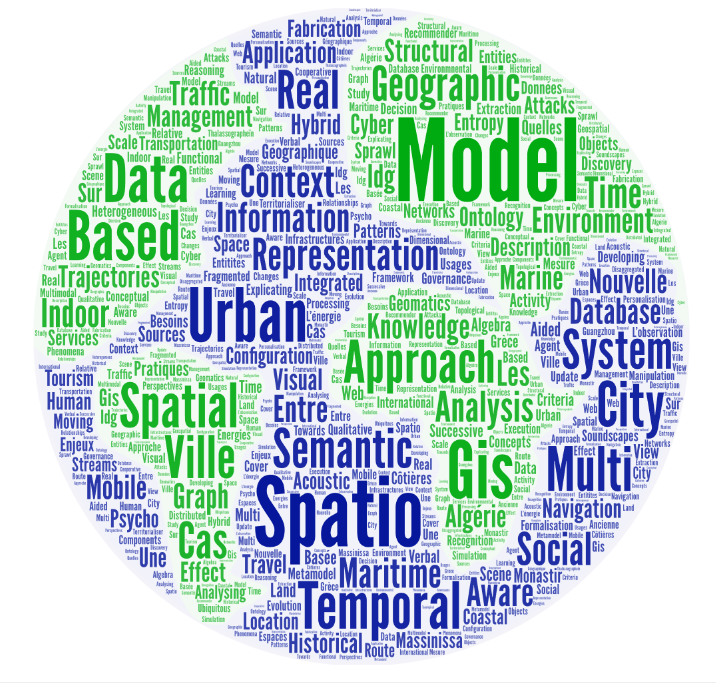 Younes Hamdani, A spatio-temporal hybrid model for geographic information, PhD in Geomatics, in co-direction with Dr. Remy Thibaud, submission planned in 2019. Thibaud Merien, A spatio-temporal entropy-based and visual approach for analysing cyber attacks, PhD in computer science, in co-directoin with Dr. David Brosset, submission planned in 2019. Roberto Zagal Flores, Geographical knowledge discovery from heterogeneous data sources, PhD in Geomatics, in co-direction with prof. Miguel Felix Mata Rivera, Instituto Politecnico Nacional, Mexico, submission planned in 2020. Mahdi Rahimi, Indoor Data Modelling for Developing Context-aware Services in Location-based Social Networks, PhD in Geomatics, in co-direction with prof. Mohamad Reza Malek, K. N. Toosi University of Technology, Tehran, submission planned in 2019. Asma Rejeb Bouzgarrou, Urban sprawl effect: successive urban fragmented configurations of the city of Monastir, PhD in Geomatics, in co-direction with prof. Hichem Rejeb, University de Bretagne Occidentale and University of Sousse, Tunisia, 15 January 2019. Julien Desbonnet, International analysis of geographical information in coastal governance, PhD in Geography, in co-direction with Dr. Françoise Gourmelon (LETG, UBO), submission planned in 2019. Amin Hoseinpoor, Recognition of activity patterns based on semantic trajectories in urban environments, PhD in Geomatics, co-directed with professor Rahim Abbaspour, University of Tehran, submission planned in 2019. Zahra Bahramian, A context-aware ontology for a tourism recommender system, PhD in Geomatics, co-directed with professor Rahim Abbaspour, University of Tehran, 22 September 2017. Meihan Jin, A conceptual and semantic modelling approach for the representation of human travel, PhD in Computer Science, co-directed with prof. Jianya Gong, Central South University, China, 18 september 2017. Loic Salmon, Management and processing of real-time streams and historical spatio-temporal data: Application to the analysis of marine traffic, PhD in Computer Science, co-directed with Dr Cyril, Ray, 17 January 2019. Ines Jguirim, A functional and structural analysis of a city urban space, PhD in Geomatics, co-directed with Dr David Brosset, University of West Brittany, 28 November 2016. Mathieu Domingo, A graph-based model for the representation of spatial structures, PhD in Geomatics, co-directed with Dr Remy Thibaud,University of West Brittany, 4 December 2016. Tolue Silavi, Explicating the semantic concepts in spatial databases, PhD in GIS, co-supervised with Dr Farshad Hakimpour & Dr Farshad Nourian, School of Surveying Engineering and Spatial Information, University of Tehran, September, 2016. Donia Zheni, A spatio-temporal and semantic algebra for the representation and manipulation of the trajectories of mobile objects , PhD in Computer Science, in co-direction with Ali Frihida , University of Tunis, 28th September 2015. Jing Wu, A qualitative spatio-temporal modelling and reasoning approach for the representation of moving entities, PhD in Computer Science, co-directed with prof. Min Deng, Department of Geo-Informatics, Central South University, China, PhD in Computer Science, 14th September, 2015. Willington Siabato, A metamodel for the integration of temporal and semantic components into geographic information, PhD. in Geomatics, submission planned in 2015. For a survey on temporel GIS research see the Timebliography project. Dieudonné Tsatcha, Extraction and Representation of Maritime Environment Knowledge: A Framework for Navigation Applications, PhD in Computer Sciences, co-directed with Dr Eric Saux, 11th December 2014. Jade Georis-Creuseveau, Les Infrastructures de Données Géographiques (IDG) Côtières : quels enjeux ? quels besoins ? quels usages ? quelles perspectives ?, PhD in Geomatics, in co-direction with Françoise Gourmelon (LETG, UBO), University of West Brittany, 5th December 2014. Nicolas Maslov, A multi-criteria decision-aided geographical systems for marine energies, PhD in Computer Science, co-directed with Dr Jean-Frédéric Charpentier, January 2015. Yann Flety, Territorialiser l'énergie, une approche géographique basée sur l'observation, PhD in Geography, in co-direction with Marie-Hélène de Sède (THEMA, University of Besançon), January 2014. Imad Afyouni, Knowledge representation and management in indoor mobile environments, PhD in Computer Science, Naval Academy Research Institute, September 2013. Géraldine del Mondo, A spatio-temporal graph model for the representation of the evolution of geographical entitites, PhD in Computer Science, Naval Academy Research Institute, 2011. Jean-Marie le Yaouanc, Formalisation of an environmnental scene from its verbal description, PhD in Computer Science, Naval Academy Research Institute, 2009. Mathieu Petit, A spatial approach to execution-context modeling in ubiquitous information systems, PhD in Computer Science, Naval Academy Research Institute, 2009. Jean-Marie Kowalski, Thalassographeïn: Mesure, représentation et description des espaces maritimes en Grèce ancienne, Naval Academy Research Institute, 2009. David Brosset, A modelling an cooperative learning approach for route description in natural environments, PhD in Computer Science, Naval Academy Research Institute, 2008. Shaopei Chen, A multi-scale and multi-dimensional transportation GIS for the city of Guangzhou, China, PhD in Geomatics, Naval Academy Research Institute, 2008. Valérie Noyon, A relative view of spatio-temporal trajectories: Application to maritime navigation, PhD in Computer Science, Naval Academy Research Institute, 2007. Yanwu Yang, Towards spatial web personalisation, PhD in Computer Science, Naval Academy Research Institute, 2006. Sébastien Fournier, An integrated multi-agent system and GIS for maritime navigation, PhD in Computer Science, Naval Academy Research Institute, 2005. Rodéric Béra, An ontological approach for the analysis of topological relationships in spatial structures, PhD in Computer Science, Naval Academy Research Institute, 2004. Cyril Ray, Distributed modelling and simulation of disaggregated phenomena, PhD in Computer Science, Naval Academy Research Institute, 2003. Adam Etches, A geospatial multimodal transportation database, PhD in Computer Science, University of Newcastle, 2001. Kalin Penev, A real time GIS for the management of a traffic system, The Nottingham Trent University, 2001. Lou Mendonça , A spatio-temporal model for the study of land-cover changes, PhD, Swiss Federal Institute of Technology, Lausanne, 1998. Laurent Spery, Historical management and update of a geographical database, PhD in Geography, University of Avignon, 1999. My research activties can be visually represented using the concept of "word clouds" that give prominence to words that appear most often. The image below has been generated from research papers published recently with some of my doctoral students.